Next year will be the year that the big technology companies go after local publishing and broadcasting businesses more fiercely than ever before. Most local media companies have no idea what’s about to hit them – much less a plan to respond. Google already has feet on the street from Portland to New York City to sell search advertising and directory listings to small and medium business (SMBs). It is only a matter of time until the company targets ever-smaller markets like Cincinnati. Oops, it looks like it already has. Sales to local SMBs are absolutely the last stronghold for newspapers and Yellow Pages. If Google (and others) move in effectively with low-cost, high-touch services, then local publishers – who long have enjoyed the mastery of their domains and the pricing power it afforded – will be in a world of hurt. Microsoft this month grabbed a lead in the eventual disaggregation of local broadcast and cable TV audiences by adding a host of popular programming services, including Netflix and ESPN, to the Xbox network that reaches some 35 million households. Impressive as the new voice- and gesture-controlled Microsoft console is, the big kahuna – Apple – has yet to roar. Steve Jobs is reported to have said in his dying breath that he had cracked the code of delivering a great experience to the big screen in the living room. Given his iTrackRecord, it’s hard to bet against him, but Google, Sony, Amazon, Netflix and a host of others will. When someone gets Internet-powered TV right – and someone most assuredly will – then local broadcast and cable TV audiences will shatter – and their business models will follow. For an example of how this might play out, consider this: The terrestrial AM-FM radio audience is barely a third as large today as it was in 2000, according to Bridge Ratings, an independent analytics service. With revenues expected to reach “only” $2 billion this year, Facebook hasn’t siphoned away many local advertising dollars. Yet. But the intoxicating "ME"-ness of its content is carving heavily into the audiences of all traditional media, with Alexa.Com reporting that the average visit to Facebook lasts 21 minutes while the average session at, say, a newspaper website runs 3.5 minutes. It is axiomatic that advertisers will follow audiences, especially since Facebook allows marketers to specify such things as the Zip Code, age, education, marital status, sexual orientation and other specific interests of the target consumer. As is the case with Google’s outrageously profitable AdWords system (which delivers a significant share of the $36 billion in ad revenues the company is likely to book this year), marketers can opt to pay only when someone clicks on a Facebook ad, creating not only superior efficiency but sophisticated analytics that trump “Mad Men”-style marketing with free, actionable and real-time metrics. Not a local media company in the land can compete with the breadth and granularity of the Facebook platform. But, it gets worse: It's only a matter of time until daughters and sons inherit the body shop or mattress business from their dads. Once they do, these next-gen business leaders will turn to Facebook – and not the local media – to find customers among their friends and the friends of their friends. By comparison, the high-priced advertising alternatives offered by most local media companies will be, well, mighty unfriendly. This is the known territory that local media companies will face in 2012 and beyond. But, as the noted deep-thinker Donald Rumsfeld once said, there are unknowns to contend with, too. The unknowns are game-changing innovations we can’t conceive. Depending on your generation, try to remember what the world was like before radio, VCRs, mobile phones, the Internet or iPads. These compelling breakthroughs blasted out of nowhere and into the mainstream, roiling everything in their path. Now, imagine all those things happening at the same time. That’s what the world will look like until further notice. And most local media companies aren't ready. Last month, we discussed the generous contribution publishers have been making to the dramatic growth of Facebook, a wondrously addictive medium that seems to be commanding ever-greater amounts of time from an ever-larger number of consumers. Today, we’re going to talk about how newspapers can get Facebook to work as effectively for them as most papers have been working for Facebook. With roughly half of the U.S. population having at least a passing relationship with Facebook, it is understandable that publishers not only have scrambled to cover the social network’s swift rise but also scurried to create their own environments on Facebook, which they faithfully promote on each and every one of their web pages. Several publishers even have outsourced to Facebook the authentication and publication of comments on their sites. To date, however, all the free ink and all the free links provided by publishers have produced much more benefit for Facebook than newspapers. Even though the viral nature of Facebook undoubtedly has boosted web traffic for publishers, the financial return in this relationship has been stacked decidedly in Facebook’s favor. Because newspapers have done almost nothing to monetize their investments in Facebook, Twitter and the various other social sites they nourish with links and content, the social media revenues realized by the newspaper industry this year will amount to no more than a rounding error in comparison to the $4 billion in keyword ad sales that Facebook is expected to book in 2010. This lopsided arrangement has got to stop for two reasons. First, the social media have such large and deeply engaged audiences that newspapers must find a way of making money off this disruptive new media ecosystem. 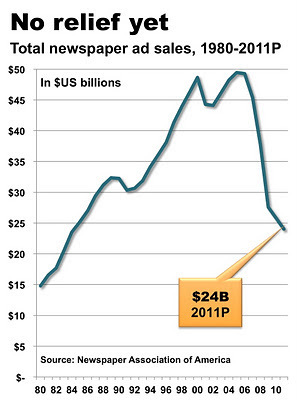 Second, newspapers need new revenue sources because their core businesses are shrinking. Fortunately, publishers already know how the media business works: Produce valuable content. Assemble a desirable audience. Sell access to the audience. Make a profit. Repeat. • Discover audiences and their interests. This involves continually searching for Facebook pages, Twitter feeds, YouTube videos, blogs and other media that are operating in the big, wide web beyond your Newspaper.Com site. Leverage the socialness of the social media to ask open-ended questions and run polls to discover what’s on the minds of people in your communities. • Acquire content and audience. This includes not only promoting the content you produce but also encouraging user-generated content and aggregating content from other digital publishers. Because links are the sincerest form of flattery on the web, the people you link to often will link back to you. You also can build your following by following the people who follow you. • Share news, videos, contests, offers and more. The magic of the social media is their viral nature. Leverage that behavior by producing a continuous stream of engaging activities that encourage friends to invite friends to read a story, respond to a poll, register for a sweepstakes or share a free music track. • Make money. While publishers generally have demonstrated some facility with the three previous activities, they have failed miserably at making money off their efforts. The direct ways to monetize the social media are to use them to run ads on your Facebook page for your clients (it can be done without running afoul of Facebook rules but read them carefully) and to create an e-marketplace for selling everything from merchandise to movie tickets. The most intriguing and perhaps most productive approach for making money off Facebook, however, is for newspapers to take over the social media marketing and advertising campaigns for businesses in their markets. Fortunately for publishers, this happens to be one of the primary pain points for local businessmen. A recent survey by Forrester Research, the market research company, found that 77% of the mangers of small and medium businesses are concerned about building their social-marketing presence. But nearly all of them say they are so bewildered about what to do and so overwhelmed with the ordinary chores of running their businesses that they want someone to help. Following the steps discussed above, publishers rapidly can become the trusted social-marketing sherpas that local businesses want. Because social marketing is a never-ending chore of discovering and acquiring audiences and content, such services represent a rich source of new and recurring revenues for newspapers. Social campaign management can be combined with additional services, including direct marketing; web and mobile site hosting, and ad placement on such third-party sites as Google and Facebook. The few newspapers that have moved wholeheartedly to this so-called agency approach are diversifying their client bases and strengthening their revenues streams at the same time they are reducing their dependence on the sagging print-advertising business. It has made Facebook their new best friend. Newspaper advertising sales this year will come in at less than half the record $49.4 billion achieved as recently in 2005, according to an analysis of the year-to-date performance of the industry. After slipping by 9.5% and 8.9% in the first two quarters of the year, print ad revenues took a turn for the worse in the third period, tumbling by 10.8%, according data complied by the Newspaper Association of America. If you add the total $17.1 billion in sales reported by the industry in the first nine months of this year to the $7.3 billion in revenues achieved in the final quarter of 2010, publishers would be looking at $24.4 billion in revenues for 2011. Given the weak performance in the first part of this year, it is hard to believe newspapers will do as well in the fourth quarter of this year as they did in 2010. It won’t take much of a sales slide in Q4 for 2011 revenues to come in under $24 billion. 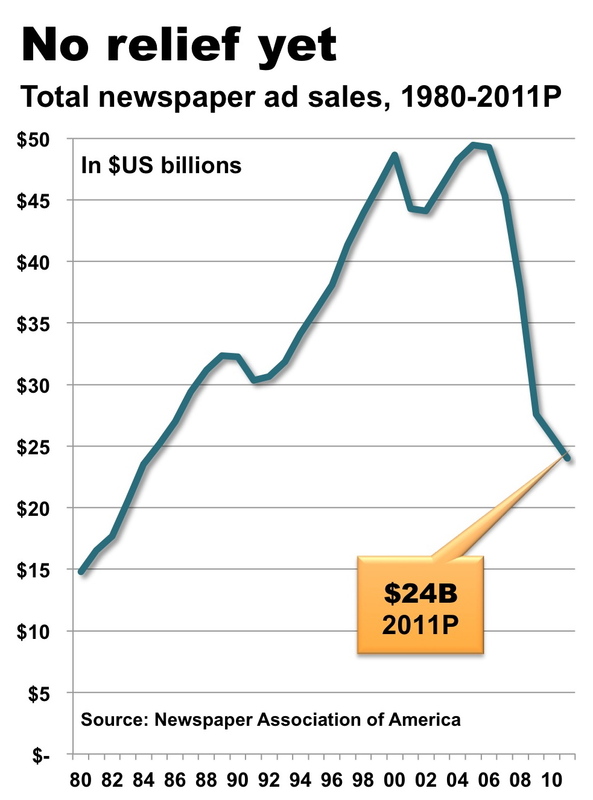 The last time newspaper revenues were this low was 1984, when the industry had $23.5 billion in sales. Adjusted for inflation, that sum is equal to $48.7 billion in 2010 dollars. :: Retail, the most significant remaining revenue category for newspapers, dropped 8.8% to $8.4 billion in the first nine months of 2011 from the same period a year ago. :: Classified advertising, which has been battered by online competitors and prolonged weakness in the employment and the real estate markets, plunged 12.9% to $1.2 billion in the nine months. :: National advertising fell by a bit less than 11% to $2.7 billion in the nine months. The only bright spot was digital advertising, which climbed 8.3% over the prior year to $2.3 billion. Unfortunately, digital advertising contributes only a slender 14.3% of publisher revenues. While this is an improvement over prior years, it must be noted that the percentage of the digital revenues is boosted as much by the decline in the denominator (total sales) as by the increase in the numerator (digital revenues). Barring a Christmas/Hanukkah/Kwanza sales miracle in the fourth quarter, 2011 will go down in publishing history as the most disappointing for publishers since the wheels started coming off the industry in 2006. This year was the year that many publishers believed an improving economy would halt, if not reverse, the revenue slide that commenced in the spring of 2006 and hasn’t abated since. Technically, the economy did rebound in 2011, though not from the perspective of the millions of unemployed individuals and foreclosed homeowners. 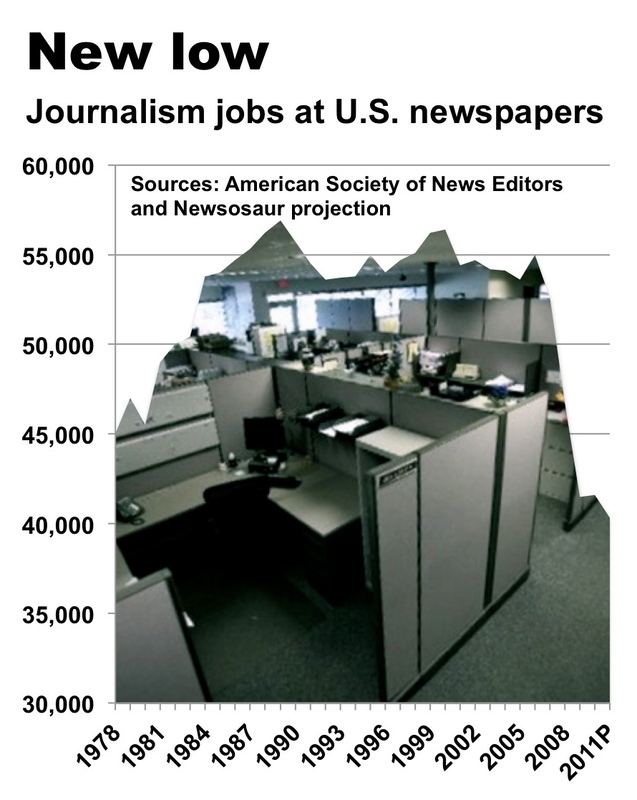 But the uptick, such as it was, bypassed newspapers. Given the disappointing way things turned out, most publishers are bracing for further deterioration in 2012 – and nipping and tucking their budgets as the new year approaches. Not a fun way to spend the holidays.